This was a quick, pretty interesting read; a one-sitting novella that serves as a prequel to Novak's series starring psychiatrist Evelyn Talbot. I tore through it, but was left with a bit of a feeling of superficiality, not so much because of the size of the story (Novak manages to pack in plenty), but the way in which the characters, setting, and events are portrayed. There are flashes of potential, and hints of further depth, but at the same time I was left with a somewhat insubstantial aftertaste. This is the first of Novak's books I have read. I understand she's written several romance tales (contemporary and historic) and it seems that she's looking to follow the authorial arrc of the likes of Tami Hoag, Lisa Gardner, and Tess Gerritsen who all shifted from romantic suspense in their earlier books to darker thrillers as their storytelling careers progressed. So perhaps HANOVER HOUSE was something of a testing of the waters for both Novak and her readers (or potential new readers). For me, someone who reads an awful lot of crimes tales, the results were lukewarm rather than scorching. There's some pretty cool set-ups in HANOVER HOUSE that may entice me to read more of the series, but at times I felt opportunities were missed rather than taken, or the execution didn't match the underlying ideas. Which was a shame. The end result was 'good-ish' rather than great. Novak sets the hook pretty well, creating a page-turning drive almost immediately. Things aren't going smoothly for the set-up of Talbot's Alaskan facility to house particularly nasty psychopaths. It's a bit of a culmination of Talbot's life work, but not everyone appreciates what she's trying to do. Especially those in the small town who understandably are feeling pretty 'nimby' about bringing all these extremely dangerous people to their neck of the woods, incarcerated or not. Talbot herself has a traumatic history, having turned to the study of the human psyche - and its abnormal manifestations - after her teenage boyfriend slaughtered three of their friends and left Evelyn for dead, her throat cut. There are some really good building blocks in HANOVER HOUSE, but the way things unfold seems a little formulaic at times. Perhaps this comes from Novak's romance writing roots, eg Evelyn is quickly thrown together with Sergeant Amarok in an 'on-the-surface-unlikely'-but-actually-rather-obvious coupling. This kind of 'author hand' occurrence happens throughout, lessening the impact of the story and causing a few reader eye rolls. Having said that, there are plenty of interesting seeds and shoots on show in HANOVER HOUSE that could grow into a fascinating series, if cultivated well. Novak has storytelling talent, and with a few tweaks here and there could possibly become a very good thriller writer. For now, readers are testing the waters as much as she is. 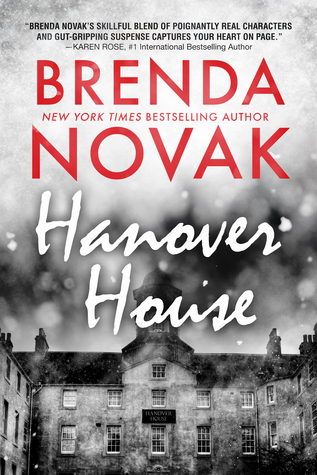 HANOVER HOUSE is a tasty morsel that doesn't linger on the palate, but might bring you back for more another time.